Relatives and friends of the al-Hajj family gather in a mosque to pray over the bodies of eight family members during their funeral in Khan Younis, in the southern Gaza Strip, on July 10, 2014. Photo by Said Khatib / AFP. List of names, now numbering 310, updated again on 19th July. The Gaza health ministry has confirmed the deaths of 121 Palestinians so far in the besieged strip since Israel began its relentless assault early Tuesday. Among those killed, at least 23 were aged 16 or younger. The two youngest victims were both 18 months old. Mohammed Malakiyeh was killed along with his 27-year-old mother, and Ranim Jawde Abdel Ghafour was killed along with a member of her family in Khan Younis. The two oldest victims were 80-year-old Naifeh Farjallah, killed in an air strike on the town of Moghraqa, southwest of Gaza City, and 80-year-old Saber Sukkar, killed in an airstrike on Gaza City. 1894. Ibrahim al-Dawawesah, 10, was killed in Israeli shelling of a mosque in north Gaza. 1895. Ahmed Naim Awkal, 22, was found in al-Najjar Hospital. 1896. Mahmoud Mohammed Salah Abu Haddaf was killed in Khan Younis. 1897. Suleiman Samir Abu Haddaf was killed in the same attack. 1898. Mahmoud Khaled Abu Haddaf was killed in the same attack. 1899. Maath Zayed, 37, was killed in al-Nsayrat. 1900. Tarek Ziad Jadallah, 25, was killed in the same attack. 1901. Nidal Mohammed Badran, 34, was killed in the same attack. 1902. Abdulhakim Suleiman al-Masdar, 56, was killed in al-Nsayrat. 1903. Moamen Akram al-Masdar, 19, was killed in the same attack. 1912. Said Atef Tamraz, 26, was killed in Rafah. 1913. Mohammed Adel al-Aydi, 28, was killed in the same attack. 1914. Mahmoud Mohammed al-Jourani, 37, was killed in Deir al-Balah. 1915. Aya Anwar al-Chaer, 13, was killed in Rafah. 1916. Ahmad Mohammed Atieh al-Masri, 17, was killed in Deir al-Balah. 1917. Anwar Mostafa al-Zaanin, 17, succumbed to his wounds. 1918. Unknown was pulled from under rubble. 1919. Unknown was pulled from under rubble. 1920. Unknown was pulled from under rubble. 1921. Unknown was pulled from under rubble. 1922. Unknown was pulled from under rubble. 1923. Unknown was pulled from under rubble. 1924. Unknown was pulled from under rubble. 1925. Unknown was pulled from under rubble. 1926. Unknown was pulled from under rubble. 1927. Unknown was pulled from under rubble. 1928. Unknown was pulled from under rubble. 1929. Unknown was pulled from under rubble. 1930. Unknown was pulled from under rubble. 1931. Unknown was pulled from under rubble. 1932. Unknown was pulled from under rubble. 1933. Unknown was pulled from under rubble. 1934. Unknown was pulled from under rubble. 1935. Unknown was pulled from under rubble. 1936. Unknown was pulled from under rubble. 1937. Unknown was pulled from under rubble. 1938. Ihsan Mahrous al-Agha was killed in Khan Younis. 1939. Hasan Hussein Kawarea was killed in Khan Younis. 1940. Maydaa Mohammed Aslan, one month, succumbed to her wounds.nformation is released. 102. Abdel Halim Ashra, 54, was killed in an airstrike on Wednesday in the area of Birka Deir al-Balah, but his body wasn’t discovered till Friday. Relatives and friends carry the body of Nour al-Najdi, 10-years-old, during her funeral in Rafah after being killed by an Israeli strike in the southern Gaza Strip, on July 11, 2014. She appears as the 92nd victim in this list. Photo by Said Khatib/AFP. 114. Ola Wishahi, 31, was killed in an attack on the Mabarra association for the disabled in Jabalia. 310. Rand Walid Likan, 27, was killed in Khan Younis. 358. Hiba Hamed al-Sheikh Khalil, 14, was killed in Gaza. 359. Toufic al-Barawi Marshoud, was killed in al-Shujaieh. 360. Ahmad Ishaq al-Rimlawi, was killed in al-Shujaieh. 361. Marwa Suleiman al-Sirsawi, was killed in al-Shujaieh. 362. Raed Mansour Nayfa, was killed in al-Shujaieh. 363. Osama Rabhi Ayyad, was killed in al-Shujaieh. 364. Ahed Moussa al-Sirsik, was killed in al-Shujaieh. 365. Fouad Jaber, was killed in al-Shujaieh. 366. Khaled Hamed, was killed in al-Shujaieh. 367. Mohammed Ayman al-Shaer, 5, was killed in Khan Younis. 368. Leila Hasan al-Shaer, 33, was killed in Khan Younis. 369. Salah Saleh al-Shaer, in his forties, was killed in Khan Younis. 589. Soha Naim al-Kharwat, 25, was killed in north Gaza. She was pregnant. 590. Mona Rami al-Kharwat, 4, was killed in north Gaza. 596. Soha Naim al-Kharwat, 25, was killed in north Gaza along with her daughter Mona. She was pregnant. 597. Mona Rami al-Kharwat, 4, was killed in the same attack. 598. Ahmad Salah abu Sido, 17, was killed in al-Mahatta. 599. Mahmoud Slim Mostafa Daraj, 22, was killed in Jabalia. 600. Ibrahim Sobhi al-Firi, 25, was killed in Beit Lahia. 601. Ahmad Assaad al-Boudi, 24, was killed in Beit Lahia. 602. Unknown was killed in Beit Lahia. 603. Raed Salah, 22, was killed in al-Breij. 604. Ahmad Nasim Saleh, 23, was killed in al-Breij. 605. Mahmoud Ghanem, 22, was killed in al-Breij. 606. Hasan Shaaban Khamisi, 28, was killed in al-Maghazi camp. 607. Tareq Fayeq Hajjaj, 22, was killed in Gaza. 608. Ahmad Ziad Hajjaj, 21, was killed in the same attack. 609. Mohammed Shahadeh Hajjaj, 31, was killed in the same attack. 610. Fayza Saleh Abdul Rahman Hajjaj, 66, was killed in the same attack. 611. Rawan Ziad Hajjaj, 15, was killed in the same attack. 612. Youssef Mohammed Hajjaj, 28, was killed in the same attack. 613. Hakema Nafea Abu Edwan, 75, was killed in Rafah. 614. Najah Nafea Abu Edwan, 85, was killed in the same attack. 615. Misaab Nafeth al-Ajala, 30, was killed in al-Shujayeh. 616. Khalaf Atieh Abu Sanima, 18, was killed in Rafah. 617. Khalil Atieh Abu Sanima, 20, was killed in the same attack. 618. Mohammed Jamal al-Jarif, 24, was killed in Khan Younis. 619. Ahmad Issam Wishah, 29, was killed in al-Wista. 620. Ahmad Kamal Abu Maghsib, 35, was killed in al-Wista. 621. Raed Abdulrahman Abu Mighsib, 35, was killed in al-Wista. 622. Ahmad Mohammed Ramadan, 30, was killed in al-Wista. 623. Mostafa Mohammed Mahmoud Fayad, 24, was killed in Gaza. 624. Unknown was found in al-Aqsa Martyrs Hospital. 625. Hani Awad Awda Samour, 75, was killed in Khan Younis. 626. Ahmad Ibrahim Shbeir was killed in Khan Younis. 627. Youssef Abu Mostafa, 27, was killed in Nosayrat. 628. Obeida Abu Howayshil was killed in Nosayrat. 629. Nour al-Islam Abu Howayshil, 12, was killed in Nosayrat. 630. Radi Abu Howayshil, 20, was killed in Nosayrat. 631. Samih Abu Jalalah, 64, was killed in Rafah. 632. Hamza Ziadeh Abu Anza, 18, was killed in Khan Younis. 633. Osama Bahjat Rajab, 21, was killed in Beit Lahia. 634. Mohammed Dauood Hamoudah, 23, was killed in Beit Lahia. 635. Sadam Ibrahim Abu Assi, 23, was killed in Khan Younis. 636. Wisam Alaa Najjar, 17, was killed in Khan Younis. 637. Unknown was killed in Khan Younis. 638. Unknown was killed in the same attack. 639. Unknown was killed in the same attack. 640. Unknown was killed in Beit Lahia. 641. Unknown was killed in Beit Lahia. 642. Mohammed Mansour al-Bashiti, was killed in Khan Younis. 643. Bassam Abdullah Abu Taimah, 23, was killed in the same attack. 644. Mohammed Naim Abu Taimah, 25, was killed in the same attack. 645. Zainab Abu Tir, a child, was killed in the same attack. 646. Ismail Abu Zarifa, 60, was killed in the same attack. 648. Adnan Ghazi Habib, 23, was killed in al-Mighraqa. 649. Mohammed Radi Abu Raida, 22, was killed in Bani Souhayla. 650. Nidal Hamad al-Ajla, 25, was killed in al-Shamaa mosque. 651. Mohammed Ziad Habib, 30, was killed in Gaza city. 653. Hasan Abu Hin, 70, was killed in al-Shujayeh. 654. M. Osama Abu Hin, 34, was killed in the same attack. 655. Al-Mostafa Abdulrahman Abu Hin, 24, was killed in the same attack. 656. Hasan Khalil Salah Abu Jamous, 29, was killed in Khan Younis. 657. Mahmoud Youssef Khaled al-Abadilah, 22, was killed in the same attack. 658. Nour Abdulrahman al-Abadilah, 24, was killed in the same attack. 659. Mohammed Farid al-Astal was killed in the same attack. 660. Unknown was killed in the same attack. 661. Mohammed Abed al-Raouf al-Deddeh, 39, was killed in Gaza. 662. Ahmad Mohammed Bilbol was killed in Gaza. 663. Hosam Ayman Ayyad, 24, was killed in al-Shujayeh. 664. Mohammed Sami Omran, 26, was killed in Khan Younis. 665. Mahmoud Awwad Ziadeh was killed in Gaza. 666. Wissam Bahjat Rajab was killed in the same attack. 667. Rabea Qassem Abu Ras was killed in the same attack. 668. Azzat Omaya al-Sayyed was killed in the same attack. 669. Ahmad Adel Homaydah was killed in the same attack. 670. Manal Mohammed al-Astal, 45, was killed in Khan Younis. 671. Yasmin Hasan Mohammed al-Moqataa, 27, was killed in Deir al-Balah. 672. Jounay Rami Yasser al-Moqataa, 2, was killed in the same attack. 673. Said Ahmad Taqfiq Tawil, 22, was killed in the same attack. 674. Raed Salem al-Radea, 20, was killed in Gaza. 675. Salma Salem al-Radea, 2, was killed in the same attack. 676. Iyad Ghaleb al-Radea, 19, was killed in the same attack. 677. Atef Ahmad Abu Daqa, was killed in Khan Younis. 678. Dr. Ibrahim Omar al-Halaq, 40, was killed in the same attack. 679. Wael Maher Awad, 23, was killed in the same attack. 680. Ahmad Mahmoud Sahwil, 23, was killed in the same attack. 681. Issam Ismail Abu Shaqra, 42, was killed in the same attack. 682. Abdel Rahman Ibrahim Abu Shaqra, 17, was killed in the same attack. 683. Mohammed Ahmad Akram Abu Shaqra, 17, was killed in the same attack. 685. Ayman Adhab Youssef al-Hajj Ahmad, 16, was killed in al-Breij. 686. Bilal Ali Ahmad Abu Adhra, 25, was killed in the same attack. 687. Abdel Karim Nasser Saleh Abu Jarmi, 24, was killed in the same attack. 688. Alaa Jihad Ali Khatab, 25, was killed in Deir al-Balah. 689. Abdel Qadir Jamil al-Khaldi, 23, was killed in al-Breij. 690. Fayez Nayef al-Thatha, 24, was killed in al-Zeitoun. 691. Fayez Naim al-Thatha, 17, was killed in the same attack. 696. Bassam Khaled Abu Shahla, 44, was killed in Absan. 697. Sleiman Sleiman al-Barim, 27, was killed in the same attack. 698. Ahmad Rifaat al-Raqab, 23, was killed in the same attack. 699. Mohammed Ismail al-Istal, 17, was killed in Beni Soheileh. 700. Ismail Mohammed al-Istal, 48, was killed in the same attack. 701. Ahmad Mohammed Ismail al-Istal, 20, was killed in the same attack. 702. Mohammed Hassan Abdel Qadir al-Istal, 43, was killed in the same attack. 703. Ibrahim Abdallah Abu Aytah, 67, was killed in Beit Lahia. 704. Ahmad Ibrahim Abdallah Abu Aytah, 30, was killed in the same attack. 705. Jamila Salim Abu Aytah, 65, was killed in the same attack. 706. Adham Ahmad Abu Aytah, 11, was killed in the same attack. 707. Khalil Nasser Atieh Wasah, 21, succumbed to his wounds after being injured in an attack in central Gaza. 708. Milad Omran al-Istal, 29, was killed in Khan Younis. 709. Mohammed Omran Khamis al-Istal, 33, was killed in the same attack. 710. Malek Amin Ahmad al-Istal, 24, was killed in the same attack. 711. Ahmad Thaer Omran al-Istal, 33, was killed in the same attack. 712. Amin Thaer Omran al-Istal, 3, was killed in the same attack. 713. Nada Thaer Omran al-Istal, 5, was killed in the same attack. 716. Hadi Abdulhamid Abdulnabi, 1.5, was killed in a mosque in Jabalia. 717. Ahmad Ibrahim Said al-Qaraan, 26, was killed in al-Wista. 718. Mohammed Ibrahim Abu Aytah, 32, was killed in Jabalia. 732. Mohammed Ibrahim Abu Daqqah, 42, was killed in Khuza’a. 733. Akram Ibrahim Abu Daqqah, 50, was killed in the same attack. 734. Ahmad Abdulkarim Ahmad Hasan was killed in Khan Younis. 735. Mohammed Ismail Khodor was killed in the same attack. 736. Ola Khalil Abu Aida, 27, was killed in al-Zahraa. 737. Anas Akram al-Skafi, 18, was killed in al-Shujayeh, along with his twin brother. 738. Saad Akram al-Skafi, 18, was killed in the same attack. 739. Mohammed Jihad Matar was killed in an attack on Beit Hanoun. 740. Amina Jihad Matar was killed in the same attack. 741. Tammam Mohammed Hamad was killed in the same attack. 742. Khadir Khalil al-Luh, 50, was killed in an attack on al-Attatara. 743. Rasmi Abu Rayda was killed in Khuza’a. 744. Mohammed Abu Youssef was killed in the same attack. 745. Ahmad Kodeih was killed in the same attack. 746. Rami Kodeih was killed in the same attack. 747. Ismail Hasan Abu Rajila, 57, was killed in Khan Younis. 748. Nafeth Suleiman Kodeih, 45, was killed in the same attack. 749. Badr Hatem Kodeih, 13, was killed in the same attack. 750. Hanafi Mahmoud Abu Youssef, 42, was killed in the same attack. 751. Abdulaziz Noureldine Nour, 21, was killed in al-Shujayeh. 752. Amir Adel Islam, 9, was killed in Rafah. 753. Issam Faisal Siyam, 24, was killed in Rafah. 754. Amir Adel Siyam, 13, was killed in Rafah. 755. Sa’er Awda Shamali, 19, was killed in al-Shujayeh. 756. Mohammed Youssef al-Qadi, 27, succumbed to his wounds in an Egyptian hospital and died. 757. Mohammed Suleiman Awkal, 36, was killed in Rafah. 758. Unknown was killed in the Israeli bombing of UNRWA school in Beit Hanoun. 759. Unknown was killed in the same attack. 760. Unknown was killed in the same attack. 761. Unknown was killed in the same attack. 762. Unknown was killed in the same attack. 763. Unknown was killed in the same attack. 764. Unknown was killed in the same attack. 765. Unknown was killed in the same attack. 766. Unknown was killed in the same attack. 767. Unknown was killed in the same attack. 768. Unknown was killed in the same attack. 769. Unknown was killed in the same attack. 770. Unknown was killed in the same attack. 771. Unknown was killed in the same attack. 772. Ahmad Jomia’an Abu Hojeir, 19, was killed in al-Wista. 773. Yasmin Ahmad Abu Mor, 27, succumbed to his wounds in an Egyptian hospital and died. 774. Mahmoud Silmi Rowayshid, 50, was killed in Rafah. 775. Duaa Raed Abu Awdeh, 17, was killed in the Israeli bombing of UNRWA school in Beit Hanoun. 776. Amer Abdelraouf Mohammed al-Azab, 26, from Deir al-Balah, was killed. 777. Mahmoud Jamad Awad Abdeen, 12, was killed in Khan Younis. 778. Mohammed Abdullah Mohammed al-Najjar was killed in the same attack. 779. Ahmad Talal al-Najjar was killed in the same attack. 780. Ashraf Ibrahim Hasan al-Najjar, 13, was killed in the same attack. 781. Sanaa Hasan Ali al-Istal was killed in the same attack. 782. Nabil Mahmoud Mohammed al-Istal, 12, was killed in the same attack. 783. Ashraf Mahmoud Mohammed al-Istal, was killed in the same attack. 791. Mohammed Rateb Abu Jazar, 26, was killed in Khan Younis. 792. Hisham Mohammed Abu Jazar, 23, was killed in the same attack. 793. Mohammed Farhan Abu Jazar, 19, was killed in the same attack. 794. Mahmoud Selmy Abu Roweished, 49, was killed in the same attack. 795. Shadi Sleiman Kuwaraa, 31, was killed in the same attack. 796. Ibrahim Jihad Abu Laban, 27, was killed in al-Zeitoun. 797. Karam Mohammad Zaqout, 12, was killed near the Nuseirat camp. 800. Mahmoud Asaad Ghaban, 24, succumbed to wounds sustained in an attack in Beit Lahia. 801. Mahmoud Sleiman al-Istal, 17, succumbed to his wounds at the European Hospital of Gaza. 802. Leila Ibrahim Zaarab, 40, succumbed to her wounds at the European Hospital of Gaza. 803. Maram Rajeh Fayyad succumbed to her wounds at the Al Aqsa Martyrs Hospital. 805. Suleiman al-Shawwaf, 21, was killed in Khan Younis. 806. Salah Ahmad Hassanein, 45, was killed in Rafah. 807. Abdulaziz Salah Hassanein, 15, was killed in the same attack. 808. Mohammed Samir Abdulal al-Najjar, 25, was killed in Khan Younis. 809. Rasmeya Salameh, 24, was killed in Khan Younis. 810. Eid Mohammed Abu Qtayfan, 23, was killed in Deir al-Balah. 811. Ali Mohammed Asfour, 58, was killed in Khan Younis. 812. Hadi Salaheldine Abu Hassanein, 12, was killed in Rafah. 813. Mohammed Ibrahim al-Khatib, 27, succumbed to her wounds in Khan Younis. 814. Rasha Abedrabeh Afaneh, 28, succumbed to her wounds in Khan Younis. 815. Abdulhadi Salah Hassanein, 9, was killed in Rafah. 816. Najat al-Najjar, 35, was killed in Bani Souhayla. 817. Iyad Nasser Shrab succumbed to her wounds in Khan Younis. 818. Sharif Mohammed Hassan, 27, was killed in Khan Younis. 819. Mohammed Khalil Hamad, 18, was killed in the same attack. 820. Mamdouh Ibrahim al-Shawwaf, 25, was killed in the same attack. 821. Walid Said al-Harazin, 5, was shot in the head by an Israeli sniper in al-Shujayeh. 822. Tarek Zohdi was killed in al-Wista. 823. Salamah Abu Kamil was killed in the same attack. 826. Mohammed Yaseen Syam was killed in Hay al-Zaytoun. 827. Rami Mohammed Yaseen was killed in the same attack. 828. Imad Adnan Abu Kamil, 20, was killed in al-Maghraqa. 829. Kamal Idwan succumbed to her wounds in a hospital in Jordan. 830. Jihad Hasan Hamad, 20, was killed in Rafah. 831. Osama Salem Shahin, 27, was killed in Khan Younis. 832. Suleiman Abu Younes, 25, was killed in the same attack. 833. Mohammed Kamel al-Naqah, 34, was found in the European Hospital of Gaza. 834. Kamal Kamal al-Naqah, 35, was found in the European Hospital of Gaza. 835. Hasan Hussein al-Hourawy, 38, succumbed to his wounds in al-Shifaa hospital. 836. Mohammed Issa Khaled Haji, 24, succumbed to his wounds in al-Shifaa hospital. 837. Hamed al-Borai, a paramedic, was killed in an Israeli strike on an ambulance in Beit Hanoun. 838. Yaseen Mostafa al-Astal, 38, was killed in Khan Younis. 850. Kamal Mohammed al-Wasifi, 26, succumbed to his wounds in al-Shifaa hospital. 851. Mazen Adnan Abidin, 23, was killed in Rafah. 852. Saleh Abidin, 35, was killed in the same attack. 853. Unknown was killed in the same attack. 854. Mohammed Abdulnaser Abu Zinah, 24, was killed in al-Zaytoun. 855. Abdulmajid Al-Aidi, 35, was killed in al-Zaytoun. 856. Mohammed Ahmad Abu Wadeyah, 19, was killed in al-Wista. 865. Yousra Salem Hasan al-Brayem, 65, was killed in al-Sohayla. 866. Mohammed Matar al-Abadilah, 32, was on his way to evacuate the injured when he was killed in an Israeli strike on an ambulance. 867. Islam Ibrahim Naji,19, was killed in al-Sheikh Radwan. 868. Mohammed Hosni al-Saqa, 20, was killed in the same attack. 869. Unknown was killed in al-Shohadaa Street. 870. Ismail Abdulqader Kojok, 53, was killed in Gaza city. 871. Ayesh Salam Armilat, 39, was killed in Gaza. 872. Hosam Abdulghani Yaseen, 15, was killed in the same attack. 894. Nidal Ahmad Issa Abulasal, 27, was killed in Rafah. 895. Slim Salam Abul Toom, 87, was killed in the same attack. 896. Abdulrahman Awda al-Tilbani was killed in al-Wista. 897. Arafat Abu Owayli was killed in the same attack. 898. Unknown was killed in the same attack. 899. Unknown was killed in the same attack. 900. Unknown was killed in the same attack. 901. Naim Abdul Aziz Abu Thaher, 36, was killed in Deir al-Balah. 902. Unknown was pulled from under rubble in Khan Younis. 903. Unknown was pulled from under rubble in Khan Younis. 904. Unknown was pulled from under rubble in Khan Younis. 905. Unknown was pulled from under rubble in Khan Younis. 906. Unknown was pulled from under rubble in Khan Younis. 907. Unknown was pulled from under rubble in Khan Younis. 908. Unknown was pulled from under rubble in Khan Younis. 909. Unknown was pulled from under rubble in Khan Younis. 910. Unknown was pulled from under rubble in Khan Younis. 911. Unknown was pulled from under rubble in Khan Younis. 912. Unknown was pulled from under rubble in Khan Younis. 913. Unknown was pulled from under rubble in Khan Younis. 914. Unknown was pulled from under rubble in Khan Younis. 915. Unknown was pulled from under rubble in Khan Younis. 916. Unknown was pulled from under rubble in Khan Younis. 917. Unknown was pulled from under rubble in Khan Younis. 918. Unknown was pulled from under rubble in Khan Younis. 919. Unknown was pulled from under rubble in Khan Younis. 920. Unknown was pulled from under rubble in Khan Younis. 921. Unknown was pulled from under rubble in Khan Younis. 922. Unknown was pulled from under rubble in Khan Younis. 923. Unknown was pulled from under rubble in Khan Younis. 924. Unknown was pulled from under rubble in Khan Younis. 925. Unknown was pulled from under rubble in Khan Younis. 926. Unknown was pulled from under rubble in Khan Younis. 927. Unknown was pulled from under rubble in Khan Younis. 928. Unknown was pulled from under rubble in Khan Younis. 929. Unknown was pulled from under rubble in Khan Younis. 930. Unknown was pulled from under rubble in Khan Younis. 931. Unknown was pulled from under rubble in Khan Younis. 932. Unknown was pulled from under rubble in Khan Younis. 933. Unknown was pulled from under rubble in Khan Younis. 934. Unknown was pulled from under rubble in Khan Younis. 935. Unknown was pulled from under rubble in Khan Younis. 936. Unknown was pulled from under rubble in Khan Younis. 937. Unknown was pulled from under rubble in Khan Younis. 938. Unknown was pulled from under rubble in Khan Younis. 939. Unknown was pulled from under rubble in Khan Younis. 940. Unknown was pulled from under rubble in Khan Younis. 941. Unknwon was pulled from under rubble in Rafah. 942. Unknown was pulled from under rubble in al-Wista. 943. Unknown was pulled from under rubble in al-Wista. 944. Unknown was pulled from under rubble in al-Wista. 945. Unknown was pulled from under rubble in al-Wista. 946. Unknown was pulled from under rubble in al-Wista. 947. Unknown was pulled from under rubble in al-Wista. 948. Unknown was pulled from under rubble in al-Wista. 949. Unknown was pulled from under rubble in al-Wista. 950. Unknown was pulled from under rubble in al-Wista. 951. Unknown was pulled from under rubble in al-Wista. 952. Unknown was pulled from under rubble in al-Wista. 953. Unknown was pulled from under rubble in al-Wista. 954. Unknown was pulled from under rubble in al-Wista. 955. Unknown was pulled from under rubble in al-Wista. 956. Unknown was pulled from under rubble in al-Wista. 957. Unknown was pulled from under rubble in Gaza. 958. Unknown was pulled from under rubble in Gaza. 959. Unknown was pulled from under rubble in Gaza. 960. Unknown was pulled from under rubble in Gaza. 961. Unknown was pulled from under rubble in Gaza. 962. Unknown was pulled from under rubble in Gaza. 963. Unknown was pulled from under rubble in Gaza. 964. Unknown was pulled from under rubble in Gaza. 965. Unknown was pulled from under rubble in Gaza. 966. Unknown was pulled from under rubble in Gaza. 967. Unknown was pulled from under rubble in Gaza. 968. Unknown was pulled from under rubble in Gaza. 969. Unknown was pulled from under rubble in Gaza. 970. Unknown was pulled from under rubble in Gaza. 971. Unknown was pulled from under rubble in Gaza. 972. Unknown was pulled from under rubble in Gaza. 973. Unknown was pulled from under rubble in Gaza. 974. Unknown was pulled from under rubble in Gaza. 975. Unknown was pulled from under rubble in Gaza. 976. Unknown was pulled from under rubble in Gaza. 977. Unknown was pulled from under rubble in Gaza. 978. Unknown was pulled from under rubble in Gaza. 979. Unknown was pulled from under rubble in Gaza. 980. Unknown was pulled from under rubble in Gaza. 981. Unknown was pulled from under rubble in Gaza. 982. Unknown was pulled from under rubble in Gaza. 983. Unknown was pulled from under rubble in Gaza. 984. Unknown was pulled from under rubble in Gaza. 985. Unknown was pulled from under rubble in Gaza. 986. Unknown was pulled from under rubble in Gaza. 987. Unknown was pulled from under rubble in Gaza. 988. Unknown was pulled from under rubble in Gaza. 989. Unknown was pulled from under rubble in Gaza. 990. Unknown was pulled from under rubble in Gaza. 991. Unknown was pulled from under rubble in Gaza. 992. Unknown was pulled from under rubble in Gaza. 993. Unknown was pulled from under rubble in Gaza. 994. Unknown was pulled from under rubble in Gaza. 995. Unknown was pulled from under rubble in Gaza. 996. Unknown was pulled from under rubble in Gaza. 997. Unknown was pulled from under rubble in Gaza. 998. Unknown was pulled from under rubble in Gaza. 999. Unknown was pulled from under rubble in Gaza. 1000. Unknown was pulled from under rubble in Gaza. 1001. Unknown was found in north Gaza. 1002. Unknown was found in north Gaza. 1003. Unknown was found in north Gaza. 1004. Unknown was found in north Gaza. 1005. Unknown was found in north Gaza. 1006. Unknown was found in north Gaza. 1007. Unknown was found in north Gaza. 1008. Unknown was found in north Gaza. 1009. Unknown was found in north Gaza. 1010. Unknown was found in north Gaza. 1011. Akram Ahmad al-Shanbari, 23, succumbed to his wounds. 1012. Youssef jamil Sobhi Hamoudah, 16, succumbed to his wounds in al-Shifaa Hospital. 1017. Unknown was killed in al-Wista. 1018. Unknown was killed in the same attack. 1019. Unknown was killed in Absan. 1020. Hazem Fayyez Abu Shamala, 33. The location of death was unreported. 1021. Ibrahim Khalil al-Deirawi, 27, was killed in central Gaza. 1022. Alaa Nahed Matar, 24, was killed in the same attack. 1024. Ahmad Sayid Mataer, died of wounds incurred in al-Maghazi camp. 1025. Ahmad Abu Sweireh, 23, was killed in Nusseirat. 1026. Mohammed Haroun, 29, was killed in the same attack. 1027. Khaled Abdel Sattar Sahmoud, was killed in Khan Younes. 1028. Youssef Abed Shhade al-Masri, 24, was killed in al-Shujayeh. 1029. Jalila Faraj Ayyad was killed in Gaza. 1033. Imad Jamil al-Abdel Bardawil, died at the al-Shifa hospitals of wounds sustained on July 11. 1034. Azza Abdel Karim Abdel Haman al-Falit, 44, succumbed to her wounds in an Egyptian hospital. 1035. Hassan Hassan al-Hawari, 31, succumbed to wounds sustained on July 21 in a Jerusalem hospital. 1036. Samih Ijneid, 4, was killed by tank fire in northern Gaza. 1037. Unknown, killed in an attack on a public garden in the Beach refugee camp. 1038. Unknown, was killed in the same attack. 1039. An unidentified child was killed in the same attack. 1040. An unidentified child was killed in the same attack. 1041. An unidentified child was killed in the same attack. 1042. An unidentified child was killed in the same attack. 1043. An unidentified child was killed in the same attack. 1044. An unidentified child was killed in the same attack. 1045. An unidentified child was killed in the same attack. 1046. An unidentified child was killed in the same attack. 1050. Yahya Mohammed Abdallah al-Aaqad, 49, was killed in al-Fakhari. 1051. Maryam Khalil Abed-Rabboh, 70, was killed in an attack in Jabalia. 1052. Hani Abu Khalifa, was killed in the same attack. 1053. Youssef Imad Qaddoura, a child, was killed in the same attack. 1054. Hind Imad Qaddoura, a child, was killed in the same attack. 1055. Mohammed Moussa Aalwan, a child, was killed in the same attack. 1056. Ayman Adnan Moussa Shaker, 25, was killed in Central Gaza. 1057. Mahmoud Oussama al-Qassas, was killed in Khan Younis. 1058. Shadi Abdel Karim Farwaneh, was killed in the same attack. 1059. Mustafa Abdel Samiaa al-Aabadala, was killed in the same attack. 1060. Rami Khaled al-Raqab, 35, was killed in the same attack. 1061. Naji Ahmad al-Raqab, 19, was killed in the same attack. 1062. Mohammed Jumaa Shaat, 30, was killed in the same attack. 1063. Mohammed Fadl al-Agha, 30, was killed in the same attack. 1064. Ahmad Nader al-Agha, was killed in the same attack. 1065. Marwa Nader al-Agha, was killed in the same attack. 1066. Dalia Nader al-Agha, was killed in the same attack. 1067. Unknown, was found under the rubble in Khuza’a. 1068. Unknown, was found under the rubble in Khuza’a. 1069. Unknown, was found under the rubble in Khuza’a. 1070. Unknown, was found under the rubble in Khuza’a. 1071. Unknown, was found under the rubble in Khuza’a. 1072. Unknown, was found under the rubble in Khuza’a. 1073. Unknown, was found under the rubble in Khuza’a. 1074. Unknown, was found under the rubble in Khuza’a. 1075. Unknown, was found under the rubble in Khuza’a. 1076. Unknown, was found under the rubble in Khuza’a. 1077. Unknown, was found under the rubble in Khuza’a. 1078. Unknown, was found under the rubble in Khuza’a. 1079. Ramzy Hussein al-Far, 68, was killed in al-Wista. 1080. Salem Mohammed Badawi al-Far, 59, was killed in the same attack. 1081. Issa Kamal Abdel Haman Moussa, 61, was killed in the same attack. 1082. Abdel Samad Mahmoud Ahmad Ramadan, 16, was killed in the same attack. 1083. Ayman Adnan Moussa Chokr, 25, was killed in the same attack. 1083. Fayza Ahmad Abdel Fattah al-Nadi,59, succumbed to wounds sustained during Monday’s attack on Jabalia. 1084. Mahmoud Abdel Jalil Abu Kwik, 31, was killed in an unspecified location. 1085. Azza Abdulkarim Abdulhaman al-Fleit, 44, succumbed to wounds in an Egyptian hospital. 1086. Unknown, a child, was killed in al-Wista. 1087. Ahmad Abdullah Hasan Abu Zeid was killed in Rafah. 1088. Widad Ahmad Salameh Abu Zeid was killed in the same attack. 1089. Shamma Wael Abu Zeid was killed in the same attack. 1090. Mariam Marzouq Abu Zeid was killed in the same attack. 1091. Falastin Mohammed Abu Zeid was killed in the same attack. 1092. Abdullah Nidal Abu Zeid, a child, was killed in the same attack. 1093. Bisan Iyad Abu Zeid was killed in the same attack. 1096. Unknown was killed in al-Breij. 1097. Unknown was killed in al-Breij. 1098. Unknown was killed in al-Breij. 1099. Unknown was killed in al-Breij. 1100. Unknown was killed in al-Breij. 1101. Unknown was killed in al-Breij. 1154. Ayman Samir Qishta, 30, was killed in Rafah. 1155. Ismail Shahin, 27, was killed in the same attack. 1156. Tahrir Nasr Jaber, 15, was killed in Gaza. 1157. Mohammed Ata al-Najjar, 2, was found in Naser Medical Center. 1158. Rafiq Ata al-Najjar, 3, was found in Naser Medical Center. 1159. Marwan Khalil Jibril, 40, was killed in al-Nusseirat camp. 1160. Mohammed Imad Abu Hamed, 21, was killed in the same attack. 1161. Mahmoud Mohammed Hamad was killed in Khan Younis. 1162. Misaab Ahmad Sawih, 17, was found in the European Hospital. 1163. Nariman Khalil al-Agha, 39, was found in the European Hospital. 1164. Ali Mohammed Abu Maarouf, 23, was found in the European Hospital. 1165. Unknown was found in Kamal Idwan Hospital. 1166. Unknown was found in Kamal Idwan Hospital. 1167. Unknown was found in Kamal Idwan Hospital. 1168. Unknown was found in Kamal Idwan Hospital. 1169. Unknown was found in Kamal Idwan Hospital. 1170. Unknown was found in Kamal Idwan Hospital. 1171. Unknown was found in Kamal Idwan Hospital. 1172. Unknown was found in Kamal Idwan Hospital. 1173. Unknown was found in Kamal Idwan Hospital. 1174. Bashir al-Hajjar, his car was targeted by an Israeli strike in Gaza. 1175. Mounir al-Hajjar was killed in the same attack. 1176. Hanaa Naim Balata was killed in Jabalia camp. 1177. Doaa Naim Balata was killed in the same attack. 1178. Israa Naim Balata was killed in the same attack. 1179. Mariam Naim Balata was killed in the same attack. 1180. Yehya Naim Balata was killed in the same attack. 1181. Naim Nathmi was killed in the same attack. 1182. Sahar Motawea Balata was killed in the same attack. 1183. Unknown was killed in the same attack. 1184. Unknown was killed in the same attack. 1210. Suleiman Misaed Borham al-Hashash, 30, was killed in Rafah. 1211. Jamal Ramadan Lafi, 50, was killed in the same attack. 1212. Mahmoud Salamah Dahir, 18, was killed in Rafah. 1213. Rim Abdulaziz Mohammed Dahir, 29, was killed in the same attack. 1214. Moamen Mahmoud Salamah Dahir, 9, was killed in the same attack. 1215. Ghaidaa Omar Salamah Dahir, 7, was killed in the same attack. 1216. Unknown was killed in Jabalia. 1217. Unknown was killed in Jabalia. 1218. Unknown was killed in Jabalia. 1219. Unknown was killed in Jabalia. 1220. Unknown was killed in Jabalia. 1221. Unknown was killed in Jabalia. 1222. Unknown was killed in Jabalia. 1223. Unknown was killed in Jabalia. 1224. Unknown was killed in Jabalia. 1225. Unknown was killed in Jabalia. 1226. Unknown was killed in Jabalia. 1227. Soujoud Abdulhakim Alyan, 11 and disabled, was killed in Yafa street. 1228. Walid Shahda Marzouq Moamar, 51, was killed in Rafah. 1229. Asmaa Abdulhalim Abu Alkas, 16, was killed in al-Breij camp. 1230. Ali Mahmoud al-Astal, 23, was killed in Khan Younis. 1231. Khaled Salim al-Astal, 26, was killed in the same attack. 1232. Mohammed Salim al-Astal, 26, was killed in the same attack. 1233. Ramzi Ibrahim al-Astal, 21, was killed in the same attack. 1234. Awda Ahmad Ali al-Astal, 25, was killed in the same attack. 1235. Ahmad Mahmoud Suleiman al-Astal, 26, was killed in the same attack. 1236. Ahmad Ibrahim Ali al-Astal was killed in the same attack. 1237. Khalil Ibrahim Ali al-Astal was killed in the same attack. 1238. Ezzeddine Jobr Mohammed al-Astal was killed in the same attack. 1239. Mohammed Mahmoud Mohammed al-Astal was killed in the same attack. 1240. Ahmad Mohammed Yassin al-Majayda succumbed to his wounds. 1241. Issam Jaber al-Khatib was killed in an Israeli strike on Abu Hussein School in Jabalia. 1242. Said Abu Jalala was killed in the same attack. 1243. Taysir Hamad was killed in the same attack. 1244. Loai al-Firi was killed in the same attack. 1245. Bassem Khaled al-Najjar was killed in the same attack. 1246. Thaer Khaled al-Najjar was killed in the same attack. 1247. Osama Mohammed Sahweel was killed in the same attack. 1248. Bilal Medhat al-Amoudi was killed in the same attack. 1249. Mohammed Moussa Ghaban was killed in the same attack. 1250. Adel Mohammed Abu Qamar was killed in the same attack. 1251. Abdullah Medhat al-Amoudi was killed in the same attack. 1252. Ramadan Khodr Salman was killed in the same attack. 1253. Alaa Khodr Salman was killed in the same attack. 1254. Ali Ahmad Shahin was killed in the same attack. 1255. Rami Barakat was killed in the same attack. 1256. Mohammed Izzat Abu Swayreh, 34, was killed in al-Wista. 1257. Hussein Mohammed Abu Rizk, 36, was killed in Rafah. 1258. Ahed Zqouut was killed in the Italian Compound. 1259. Omar Awad al-Brayem, 20, was killed in Khan Younis. 1260. Jihad Salah Mohammed al-Brayem, 28, was killed in the same attack. 1261. AbdulAziz Hosni Abu Hjris, 25, was killed in the same attack. 1262. Mohammed Suleiman Abdullatif al-Qara, 31, was killed in the same attack. 1263. Kamal Ahmad Mohammed al-Brayem, 57, was killed in the same attack. 1264. Unknown was killed in al-Toffah. 1265. Unknown was killed in the same attack. 1266. Unknown was killed in the same attack. 1267. Unknown was killed in the same attack. 1268. Unknown was killed in the same attack. 1269. Unknown was killed in the same attack. 1270. Unknown was killed in the same attack. 1271. Odai Yehya Zaki Abu Joneid, 19, was killed in Jabalia. 1272. Abduljalil Mohammed Kamal Abu Shadaq, 35, was killed in the same attack. 1273. Jamal Shahda Abu Shadaq, 40, was killed in the same attack. 1274. Unknown, 2, was killed in the same attack. 1275. Ahmad Suleiman Ahmad Abu Amer was found in Naser Medical Center. 1276. Mohammed Ahmad Abu Amer was killed in the same attack. 1277. Marwa Ahmad Abu Amer was killed in the same attack. 1278. Marah Ahmad Abu Amer was killed in the same attack. 1279. Yasser Ahmad Abu Amer was killed in the same attack. 1280. Suleiman Ahmad Abu Amer was killed in the same attack. 1281. Moha Hajjaj Abu Amer was killed in the same attack. 1282. Iftikhar Mohammed Shahin, 50, succumbed to her wounds in al-Shifaa Hospital. 1283. Maysara Mohammed al-Taaban, 35, was killed in Dier al-Balah. 1284. Zainab Abu Jizer was killed in Khan Younis. 1285. Mariam Ahmad Hijazi was killed in Khan Younis. 1286. Ibrahim Mostafa al-Ghalban was killed in the same attack. 1287. Ismail Mahmoud al-Ghalban was killed in the same attack. 1288. Salah Hijazi was killed in the same attack. 1289. Sobheya Ibrahim Hijazi was killed in the same attack. 1290. Jamalat Mahmoud Thahir was killed in Khan Younis. 1291. Salamah Mahmoud Thahir was killed in the same attack. 1292. Mohammed Mahmoud Thahir was killed in the same attack. 1293. Mahmoud Salamah Mahmoud Thahir was killed in the same attack. 1294. Yamen Omar Salamah Thahir was killed in the same attack. 1295. Sharouq Mahmoud Thahir was killed in the same attack. 1296. Arwa Mahmoud Salamah Thahir was killed in the same attack. 1297. Ramadan Abu Jizr was killed in Khan Younis. 1298. Taysir Sababah, 22, was killed in Beit Lahia. 1299. Ahmad Mohammed Bakr succumbed to his wounds in a hospital in Jordan. 1300. Ammar Suleiman Ali al-Masdar, 31, was killed in Gaza. 1301. Hamza Yaser Mohammed Mohaysen, 23, was killed in Gaza. 1302. Wisam Dardounah was killed in Beit Lahia. 1303. Hosam Mohammed al-Najjar was found in Kamal Idwan Hospital. 1304. Shaaban Abdulaziz al-Jamal was found in Kamal Idwan Hospital. 1305. Mohammed Wisam Dardounah was killed in Beit Lahia and was found in Kamal Idwan Hospital. 1306. Alaa Joudi Khodor was found in Kamal Idwan Hospital. 1313. Unknown, might be Mohammed Suleiman Barakah. 1314. Mostafa Ahmad Abu Jalalah was killed in north Gaza. 1315. Mohammed Mazen Moussa fawdah was killed in al-Shujayeh massacre. 1316. Ahmad Abdulkarim Hanoun was killed in al-Shujayeh massacre. 1317. Saadi Saadi Faraj was killed in al-Shujayeh massacre. 1318. Hussein Said Karirah was killed in al-Shujayeh massacre. 1319. Hamdi Saadi Abu Zour was killed in al-Shujayeh massacre. 1320. Abdulkarim Hussein al-Silk was killed in al-Shujayeh massacre. 1321. Ahed Ziad al-Gharabili was killed in al-Shujayeh massacre. 1322.Abdulaziz Ibrahim al-Baltaji was killed in al-Shujayeh massacre. 1323. Lina Alaa al-Silk was killed in al-Shujayeh massacre. 1324. Abdulaziz Mohammed al-Silk was killed in al-Shujayeh massacre. 1325. Abdulhalim Mohammed al-SIlk was killed in al-Shujayeh massacre. 1326. Moataz Bassam Dib was killed in al-Shujayeh massacre. 1327. Mahmoud Mohammed Rajab was killed in al-Shujayeh massacre. 1328. Moath Khaled Tayeh was killed in al-Shujayeh massacre. 1329. Malak Jalal al-Silk was killed in al-Shujayeh massacre. 1330. Amneyah Mohammed al-SIlk was killed in al-Shujayeh massacre. 1331. Layan Nael al-Silk was killed in al-Shujayeh massacre. 1332. Abdullah Fayez Fayyad, 23, was killed in Gaza. 1333. Sohaib Saleh Salamah, 23, was killed in Gaza. 1334. Ibrahim Youssef al-Astal, 35, was killed in Gaza. 1335. Naji Mohammed Abu Moawad was killed in Jabalia. 1336. Imad Ali Asfour succumbed to his wounds. 1337. Assem Ahmad Baraka, 25, succumbed to his wounds. 1338. Alaa Abdulkarim al-Qara, 23, succumbed to his wounds. 1339. Unknown was pulled from under rubble. 1340. Unknown was pulled from under rubble. 1341. Unknown was pulled from under rubble. 1342. Unknown was pulled from under rubble. 1343. Unknown was pulled from under rubble. 1344. Unknown was pulled from under rubble. 1345. Unknown was pulled from under rubble. 1346. Unknown was pulled from under rubble. 1347. Unknown was pulled from under rubble. 1348. Unknown was pulled from under rubble. 1349. Unknown was pulled from under rubble. 1350. Unknown was pulled from under rubble. 1351. Unknown was pulled from under rubble. 1352. Unknown was pulled from under rubble. 1353. Unknown was pulled from under rubble. 1354. Unknown was pulled from under rubble. 1355. Unknown was pulled from under rubble. 1356. Unknown was pulled from under rubble. 1357. Unknown was pulled from under rubble. 1358. Unknown was pulled from under rubble. 1360. Ismail Bassam al-Qassas, 23, was killed in north Gaza. 1361. Omar Fayez Ahmad Abu Alyan, 21, succumbed to his wounds in the European Hospital. 1362. Baraa Yousef Ibrahim, 19, succumbed to his wounds in al-Aqsa Martyrs Hospital. 1363. Ahmad al-Lawh, 22, succumbed to his wounds in al-Aqsa Martyrs Hospital. 1364. Maha Abdulnabi Slim Abu Hilal was found in Abu Youssef al-Najjar Hospital. 1365. Suleiman Barakah, 31, was killed in Deir al-Balah. 1366. Aref Barakah, 58, was killed in the same attack. 1367. Majdi Mohammed Ahmad Fesayfes, 34, was killed in Khan Younis. 1368. Naji Abdullah Abu Mostafa, 31,was killed in the same attack. 1369. Hani Abdullah Abu Mostafa, 44, was killed in the same attack. 1370. Hanan Youssef Abu Taamieh was killed in the same attack. 1371. Maher al-Najjar was killed in the same attack. 1372. Mahmoud Foad al-Najjar was killed in the same attack. 1373. Mohammed Daher succumbed to his wounds in al-Shifa Hospital. 1374. Fadel Nader al-Maghari, 27, was killed in Rafah. 1375. Mahdeyah Suleiman Omar Abulouli, 58, was killed in Khan Younis. 1376. Unknown was pulled from under rubble. 1377. Unknown was pulled from under rubble. 1378. Unknown was pulled from under rubble. 1379. Unknown was pulled from under rubble. 1380. Unknown was pulled from under rubble. 1381. Unknown was pulled from under rubble. 1382. Unknown was pulled from under rubble. 1383. Unknown was pulled from under rubble. 1384. Unknown was pulled from under rubble. 1385. Unknown was pulled from under rubble. 1386. Unknown was pulled from under rubble. 1387. Unknown was pulled from under rubble. 1388. Unknown was pulled from under rubble. 1389. Unknown was pulled from under rubble. 1390. Unknown was pulled from under rubble. 1391. Abdullah Abu Shabab, 20, succumbed to his wounds in al-Shifa Hospital. 1392. Alaa Alwa, 22, succumbed to his wounds in al-Shifa Hospital. 1393. Hamza Faeq Ahmad al-Haddad, 20, was killed in east Gaza. 1394. Ibrahim Asaad Ahmad al-Haddad, 21, was killed in the same attack. 1395. Kamal Abdulkarim al-Lawh, 32, was killed in al-Barakah. 1396. Ibrahim Abdulkarim al-Lawh, 29, was killed in the same attack. 1397. Khaled Nasr al-Lawh, 46, was killed in the same attack. 1398. Amal Abdulkarim al-Masri, 48, was killed in the same attack. 1399. Elham Yehya al-Lawh, 27, was killed in the same attack. 1401. Mohammed Raafat Naim was killed in al-Saha. 1402. Hosam Raafat Naim was killed in the same attack. 1403. Unknown, was killed in Deir al-Balah. 1404. Unknown, was killed in the same attack. 1405. Unknown, was killed in the same attack. 1406. Unknown, was killed in the same attack. 1407. Unknown, was killed in the same attack. 1408. Unknown, was killed in the same attack. 1409. Atiyeh Salameh al-Hashash, 68, died in Rafah. 1410. Thaer Naji al-Aamour, 22, was killed in Khan Younis. 1411. Mohammed Youssef al-Abadaleh, 21, was killed in the same attack. 1412. Othman Fawzi Abideen, 17, was killed in the same attack. 1413. Siham al-Laham, was killed in the same attack. 1414. Saleem Ahmad Abideen, was killed in the same attack. 1415. Mohammed Ahmad Hamed, was killed in the same attack. 1416. Mohammed Omar Sharaf, 10, died at the al-Aqsa Martyrs Hospital in Deir al-Balah. 1417. Samih Kamal Abu al-Kheir, 63, was killed in Khan Younis. 1424. Unknown from the al-Bayoumi family, was killed in Nusseirat. 1425. Unknown from the al-Bayoumi family, was killed in the same attack. 1426. Unknown from the al-Bayoumi family, was killed in the same attack. 1427. Unknown from the al-Bayoumi family, was killed in the same attack. 1428. Unknown from the al-Bayoumi family, was killed in the same attack. 1429. Unknown from the al-Bayoumi family, was killed in the same attack. 1430. Unknown from the al-Bayoumi family, was killed in the same attack. 1431. Unknown from the al-Bayoumi family, was killed in the same attack. 1432. Unknown from the al-Bayoumi family, was killed in the same attack. 1433. Mohammed Adel Ashur, was killed in the same attack. 1434. Rinad Ashraf Ashur, was killed in the same attack. 1435. Abir Nahed al-Aatar, was killed in the same attack. 1437. Naameh Darwish Abu Shuqeh, was killed in the same attack. 1438. Zaher Tawfiq Abu Maktoumeh, was killed in the same attack. 1439. Lama Raafat al-Aasar, was killed in the same attack. 1440. Hassan Nasser Zaqut, was killed in the same attack. 1441. Labiba Abu Shoka, 23, died of wounds sustained in an attack in Nusseirat. 1445. Abdulamalik Abdulsalam al-Farra, 54, was killed in Khan Younis. 1446. Osama Abdulmalik al-Farra, 28, was killed in the same attack. 1447. Awatef Ezzedine al-Farra, 34, was killed in the same attack. 1448. Mohammed Mahmoud al-Farra, 12, was killed in the same attack. 1449. Lujain Bassem al-Farra, 4, was killed in the same attack. 1450. Yara Abdulsalam al-Farra, 8, was killed in the same attack. 1451. Nadin Mahmoud al-Farra was killed in the same attack. 1452. Abdullah Awad al-Brayem was killed in Gaza. 1453. Mohammed Suleiman al-Brayem was killed in Gaza. 1454. Maysoon Raafat al-Brayem was killed in Gaza. 1455. Raed Abdullatif al-Farra was killed in Gaza. 1456. Sami Suleiman al-Madani was killed in Gaza. 1457. Hosam Suleiman al-Madani was killed in Gaza. 1460. Moussa Hamad Abu Omran was pulled from under rubble. 1461. Hilal Eid Abu Omran was pulled from under rubble. 1462. Ismail Zahir Mohamadin, 26, was pulled from under rubble. 1463. Maher Jaafar Hajjaj, 54, was pulled from under rubble. 1464. Bassel Diab al-Basyouni, 37, was killed in north Gaza. 1465. Hussein Abdulhamid al-bayoumi was killed in the same attack. 1466. Ahmad Mohammed Hassanein was killed in east Gaza. 1467. Shadi Mohammed Jomaa Abu Daher, 29, was killed in al-Maghraqa. 1468. Mohammed Rizk Hassanein, 20, was killed in al-Shujayeh. 1469. Ibrahim Suleiman al-Masri, 50, was killed in the Rafah massacre. 1470. Nadia Youssef al-Masri, 45, was killed in the Rafah massacre. 1471. Ibrahim al-Masri, 6, was killed in the Rafah massacre. 1472. Mohammed Anas Arafat, 4 months, was killed in the Rafah massacre. 1473. Anas Ibrahim Hamad, 5, was killed in the Rafah massacre. 1474. Sabri Sheikh al-Eid, 35, was killed in the Rafah massacre. 1475. Mohammed Khaled al-Aloul, 30, was killed in the Rafah massacre. 1476. Ibrahim Mostafa Ghanim was killed in the Rafah massacre. 1477. Amena al-Zamili was killed in the Rafah massacre. 1478. Yehya Abdulkarim Lafi was killed in the Rafah massacre. 1479. Mousa Mohammed Abu Omran was killed in the Rafah massacre. 1480. Hilal Eid Abu Omran was killed in the Rafah massacre. 1481. Salama Mohammed al-Zalimli was killed in the Rafah massacre. 1482. Noha Jamal Abu Ziyadeh was killed in the Rafah massacre. 1483. Tayssir Ali Moamar was killed in the Rafah massacre. 1484. Hussein Salem al-Jaafari was killed in the Rafah massacre. 1485. Yosra Mohammed Abu Jizr was killed in the Rafah massacre. 1486. Ataf Hamad al-Mahmoum was killed in the Rafah massacre. 1487. Moussa Ibrahim Abu Jizr was killed in the Rafah massacre. 1488. Unknown was killed in the Rafah massacre. 1489. Unknown was killed in the Rafah massacre. 1490. Unknown was killed in the Rafah massacre. 1491. Unknown was killed in the Rafah massacre. 1492. Unknown was killed in the Rafah massacre. 1493. Unknown was killed in the Rafah massacre. 1494. Unknown was killed in the Rafah massacre. 1495. Unknown was killed in the Rafah massacre. 1496. Unknown was killed in the Rafah massacre. 1497. Unknown was killed in the Rafah massacre. 1498. Unknown was killed in the Rafah massacre. 1499. Unknown was killed in the Rafah massacre. 1500. Unknown was killed in the Rafah massacre. 1501. Soad Ali al-Bahri, 80, was killed in Beit Lahia. 1502. Sama Nael al-Barawi, 8 months, was killed in Beit Lahia. 1503. Osama Abdulmalek Abu Maala, 37, was killed in al-Nsayrat. 1504. Atef Suheil Qandil, 24, was killed in al-Maghazi. 1505. Mohammed Nouhad Yassin, 24, was killed in Hay al-Zaytoun. 1506. Fayez Tareq Yassin, 16, was killed in the same attack. 1507. Hassan Ismail Yassin, 32, was killed in the same attack. 1508. Atef al-Zamli,a paramedic, was killed in Rafah. 1509. Yousef al-Eid, a nurse, was killed in Rafah. 1510. Yousef Darbieh, a volunteer paramedic, were killed in Rafah. 1511. Ahmad Wisam Obeid, 4, succumbed to his wounds. 1512. Unknown was killed in Rafah massacre. 1513. Unknown was killed in Rafah massacre. 1514. Unknown was killed in Rafah massacre. 1515. Unknown was killed in Rafah massacre. 1516. Unknown was killed in Rafah massacre. 1517. Unknown was killed in Rafah massacre. 1518. Unknown was killed in Rafah massacre. 1519. Unknown was killed in Rafah massacre. 1520. Unknown was killed in Rafah massacre. 1521. Unknown was killed in Rafah massacre. 1522. Unknown was killed in Rafah massacre. 1523. Unknown was killed in Rafah massacre. 1524. Unknown was killed in Rafah massacre. 1525. Unknown was killed in Rafah massacre. 1526. Unknown was killed in Rafah massacre. 1527. Unknown was killed in Rafah massacre. 1528. Unknown was killed in Rafah massacre. 1529. Unknown was killed in Rafah massacre. 1530. Unknown was killed in Rafah massacre. 1531. Unknown was killed in Rafah massacre. 1532. Unknown was killed in Rafah massacre. 1533. Unknown was killed in Rafah massacre. 1534. Unknown was killed in Rafah massacre. 1535. Unknown was killed in Rafah massacre. 1536. Unknown was killed in Rafah massacre. 1537. Unknown was killed in Rafah massacre. 1538. Unknown was killed in Rafah massacre. 1539. Unknown was killed in Rafah massacre. 1540. Unknown was killed in Rafah massacre. 1541. Unknown was killed in Rafah massacre. 1542. Unknown was killed in Rafah massacre. 1543. Unknown was killed in Rafah massacre. 1544. Unknown was killed in Rafah massacre. 1545. Unknown was killed in Rafah massacre. 1546. Unknown was killed in Rafah massacre. 1547. Unknown was killed in Rafah massacre. 1548. Unknown was killed in Rafah massacre. 1549. Unknown was killed in Rafah massacre. 1550. Unknown was killed in Rafah massacre. 1551. Unknown was killed in Rafah massacre. 1552. Unknown was killed in Rafah massacre. 1553. Unknown was killed in Rafah massacre. 1554. Unknown was killed in Rafah massacre. 1555. Unknown was killed in Rafah massacre. 1556. Unknown was killed in Rafah massacre. 1557. Unknown was killed in Rafah massacre. 1558. Unknown was killed in Rafah massacre. 1559. Unknown was killed in Rafah massacre. 1560. Unknown was killed in Rafah massacre. 1561. Unknown was killed in Rafah massacre. 1562. Unknown was killed in Rafah massacre. 1563. Unknown was killed in Rafah massacre. 1564. Unknown was killed in Rafah massacre. 1565. Unknown was killed in Rafah massacre. 1567. Unknown was killed in Rafah massacre. 1568. Unknown was killed in Rafah massacre. 1569. Unknown was killed in Rafah massacre. 1570. Unknown was killed in Rafah massacre. 1571. Unknown was killed in Rafah massacre. 1572. Unknown was killed in Rafah massacre. 1573. Unknown was killed in Rafah massacre. 1574. Unknown was killed in Rafah massacre. 1575. Unknown was killed in Rafah massacre. 1576. Unknown was killed in Khan Younis. 1577. Unknown was killed in Khan Younis. 1578. Unknown was killed in Khan Younis. 1579. Unknown was killed in Khan Younis. 1604. Aseel Shaaban Ghaith, 3, was killed in Rafah. 1605. Soufian Farouq Ghaith, 35, was killed in the same attack. 1606. Farouq Ghaith, 65, was killed in the same attack. 1607. Ahlam Naaman Zouarob, 30, was killed in the same attack. 1608. Amir Raafat Zouarob, 18, was killed in the same attack. 1609. Sobheyah Zouarab, 55, was killed in the same attack. 1610. Rawan nashaat Siam, 12, was killed in the same attack. 1611. Oday Raafat Zouarab, 7, was killed in the same attack. 1612. Souad Naaman Zouarab, 34, was killed in the same attack. 1613. Shahed Raafat Zouarab, 10, was killed in the same attack. 1614. Khaled Raafat Zouarab, 8, was killed in the same attack. 1615. Unknown was killed in the same attack. 1616. Unknown was killed in the same attack. 1617. Unknown was killed in the same attack. 1618. Moussa Yassin Abu Naqira, 22, was killed in the same attack. 1619. Unknown was killed in the same attack. 1620. Unknown was killed in the same attack. 1621. Unknown was found in al-Hilal Hospital. 1622. Unknown was found in al-Hilal Hopsital. 1623. Unknown was found in Kuwait Hospital. 1624. Ahmad al-Nayreb was killed in Gaza. 1625. Souhayla al-Nayreb was killed in the same attack. 1626. Mahmoud al-Nayreb was killed in the same attack. 1627. Mohammed al-Nayreb was killed in the same attack. 1628. Moamen al-Nayreb was killed in the same attack. 1629. Haytham Yasser Abdulwahab, 16, was found in Kuwait Hospital. 1630. Mohammed Issa al-Shaer was found in Kuwait Hospital. 1631. Hossam Yasser Abu Naqira, 20, was found in Kuwait Hospital. 1632. Moussa Yaseen Abu Naqira was found in Kuwait Hospital. 1633. Alaa Maysara al-Masri was found in Kuwait Hospital. 1634. Salah al-Masri was found in Kuwait Hospital. 1635. Mohammed Fathi Ataieh was found in Kuwait Hospital. 1636. Ibrahim Fathi Atieh was found in Kuwait Hospital. 1637. Unknown was found in Kuwait Hospital. 1638. Issa Saadi al-Shaer, 40, succumbed to his wounds. 1639. Ola Bassam al-Nayreb was killed in Rafah. 1640. Arwa Mohammed al-Nayreb was killed in the same attack. 1641. Fidaa youssef Abu Suleiman, 23, was killed in Rafah. 1642. Maryam Hasan Abu Jizr, 60, was killed in the same attack. 1643. Maha Raed Abu Suleiman was killed in the same attack. 1644. Mohammed Rami Abu Suleiman was killed in the same attack. 1645. Lama Rami Abu Suleiman was killed in the same attack. 1646. Ahmad Rami Abu Suleiman was killed in the same attack. 1647. Jana Rami Abu Suleiman was killed in the same attack. 1648. Daoud Zakaria Suleiman, 54, was killed in a mosque in Jabalia. 1649. Foad Mohammed al-dada, 28, was killed in Jabalia. 1651. Amro Tareq Hasan Qandil, 17, succumbed to his wounds. 1652. Wael Nouhad al-Sayed, 23, succumbed to his wounds. 1653. Mohammed Tayssir Hasan Qandil, 20, succumbed to his wounds. 1654. Yasser Abu Youssef Abu Dabagh, 20, succumbed to his wounds in Egypt. 1655. Hamdi Mohammed Abdulaziz Ayyad was found in al-Shifa Hospital. 1656. Shadi Hamdi Mohammed Ayyad was found in al-Shifa Hospital. 1657. Youssef Dawoud Abu Madi, 65, was killed in al-Nsayrat. 1658. Hasan Youssef Abu Madi was killed in the same attack. 1659. Abdulkarim Youssef Abu Madi, 24, was killed in the same attack. 1660. Amin Youssef Abu Madi, a 5 year-old disabled, was killed in the same attack. 1661. Saadia Abu Taha, 40, was killed in Rafah. 1662. Mohammed Abu Taha, 27, was killed in the same attack. 1663. Youssef Abu Taha was killed in the same attack. 1664. Rizk Abu Taha, 2 months, was killed in the same attack. 1665. Jomaa al-Bahabesa was killed in Rafah. 1666. Ahmad al-Bahabesa was killed in the same attack. 1667. Fawaz al-Bahabesa was killed in the same attack. 1668. Sohaib al-Bahabesa was killed in the same attack. 1669. Moanes Mohammed Abu Rajila, 25, was killed in Rafah. 1670. Salma Salman Mohammed Radwan, 86, was killed in the same attack. 1671. Ibrahim Abdulhakim Dawoud al-Zaqzouq, 22, was killed in the same attack. 1672. Mohammed Ibrahim Abu Rajila, 26, was killed in the same attack. 1673. Hazem Khaled Abdulmoati Awida was killed in the same attack. 1674. Unknown was killed in the same attack. 1675. Yehya al-Nims was found in Kuwait Hospital. 1676. Hazem al-Nims was found in Kuwait Hospital. 1677. Mohammed al-Nims was found in Kuwait Hospital. 1678. Osama Abu Naqira was found in Kuwait Hospital. 1679. Mohammed Hasan Qashta was killed in Rafah. 1680. Ahmad Qashta was killed in the same attack. 1681. Hothayfa Abu Tir was found in Naser Hospital. 1682. Nabil al-Najjar was found in Naser Hospital. 1683. Kamal Abu Tir was found in Naser Hospital. 1684. Ahmad Abu Tir was found in Naser Hospital. 1685. Yehya Jamal Mousa Shabat, 29, succumbed to his wounds. 1686. Said Jawda Maarouf was found in Kamal Idwan Hospital. 1687. Loai Rizk Maarouf was found in Kamal Idwan Hospital. 1688. Unknown was killed in Khan Younis. 1689. Unknown was killed in Khan Younis. 1690. Unknown was killed in Khan Younis. 1691. Unknown was killed in Khan Younis. 1713. Hatem Abdulrahman Wahdan, 50, was killed in Jabalia. 1714. Sanyoura Wahdan, 27, was killed in the same attack. 1715. Jamila Wahdan was killed in the same attack. 1716. Fares Abu Jizr, 2, was killed in Rafah. 1717. Maria Abu Jizr, 2, was killed in the same attack. 1718. Amani Abu Jizr, 23, was killed in the same attack. 1719. Issa al-Shaer was killed in the same attack. 1720. Saed Mahmoud al-Lahwani was killed in the same attack. 1721. Nasrallah al-Masri succumbed to his wounds. 1722. Mohammed al-Hawr, 30, was killed in Rafah. 1723. Ismail Wael al-Ghoul, 60, was killed in Rafah alongside 8 of his family members. 1724. Khadra Khaled al-Ghoul, Ismail’s 62-year-old wife, was killed in the same attack. 1725. Hanadi Ismail al-Ghoul, Ismail’s 28-year-old daughter, was killed in the same attack. 1726. Asmaa Ismail al-Ghoul, Ismail’s 22-year-old daughter, was killed in the same attack. 1727. Mohammed Ismail al-Ghoul, Ismail’s 32-year-old son, was killed in the same attack. 1728. Wael Ismail al-Ghoul, Ismail’s 35-year-old son, was killed in the same attack. 1729. Malak wael al-Ghoul, 5 and Wael’s 5-year-old daughter, was killed in the same attack. 1730. Mostafa Wael al-Ghoul, Wael’s 24-days-old son, was killed in the same attack. 1731. Ismail Mohammed al-Ghoul, Wael’s 11-year-old son, was killed in the same attack. 1732. Atwa Suleiman Khattab, 64, was killed in Rafah. 1733. Mohammed Atwa Khattab was killed in the same attack. 1734. Rimas Salem al-Attar was killed in the same attack. 1735. Nivine Suleiman Khattab was killed in the same attack. 1736. Amira Ahmad Khattab was kileld in the same attack. 1737. Mahmoud Khodr Qashta was killed in Rafah. 1738. Salman Naser Abu Jabara was killed in the same attack. 1738. Ibrahim Nawar al-Shaer was killed in the same attack. 1740. Unknown was killed in Jabalia. 1741. Unknown was killed in Jabalia. 1742. Unknown was killed in Rafah. 1743. Unknown was killed in Rafah. 1744. Unknown was killed in Rafah. 1745. Unknown was killed in Rafah. 1746. Rajab Abdulrahman al-Sharafi, 10, was killed in Jabalia. 1747. Mahmoud Abdullah al-Sharafi, 26, was killed in the same attack. 1748. Najah Rajab al-Sharafi, 48, was killed in the same attack. 1749. Turkia Mahmoud Awkal, 60, was killed in Rafah. 1750. Ilham Mohammed Mahmoud Awkal, 34, was killed in the same attack. 1751. Mohammed Asaad Mohammed Awkal, 18, was killed in the same attack. 1752. Mahmoud Mohammed Naim Awkal, 10, was killed in the same attack. 1753. Ahed Badran was killed in north Gaza. 1754. Mohammed Abu Rajal, was killed by Israeli shelling of UNRWA school in Rafah. 1755. Sami Abdallah Qashta, was killed by Israeli shelling of UNRWA school in Rafah. 1756. Sami Ismail Abu Shaluf, was killed by Israeli shelling of UNRWA school in Rafah. 1757. Ahmad Khaled Abu Harbeh, was killed by Israeli shelling of UNRWA school in Rafah. 1758. Mohammed Massaoud Qashta, was killed by Israeli shelling of UNRWA school in Rafah. 1759. Hazem Abdel Basat Hilal, was killed by Israeli shelling of UNRWA school in Rafah. 1760. Omar Tareq Abu al-Rus, was killed by Israeli shelling of UNRWA school in Rafah. 1761. Ahmad Kamal al-Nahal, was killed by Israeli shelling of UNRWA school in Rafah. 1762. Youssef Akram Skafi, was killed by Israeli shelling of UNRWA school in Rafah. 1763. Tareq Sayid Abu al-Rus was killed by Israeli shelling of UNRWA school in Rafah. 1787. Bilal Abdel Karim Nejem, was killed in northern Gaza. 1788. Abdel Karim Nejem, was killed in the same attack. 1789. Ahmad Abdel Karim Nejem, was killed in the same attack. 1790. Raghad Nejem, was killed in the same attack. 1791. Suha Nejem, was killed in the same attack. 1792. Shaimaa Wael Qassem, was killed in the same attack. 1793. Unknown was killed in the same attack. 1794. Qassem Mahmoud Qassem, 40, was killed in northern Gaza. 1795. Mohammed Saadi Ahmad, 37, was killed in the same attack. 1797. Abdallah Suhail Abu Shaweesh, was killed in Nusseirat. 1798. Bassel Walid al-Talaa, 23, was killed in the same attack. 1799. Rawan Ahmad al-Majdalawi, 7, was killed in northern Gaza. 1800. Mohammed Ahmad al-Majdalawi, 6, was killed in the same attack. 1801. Abdel Razq Abdel Hadi al-Majdalawi, was killed in the same attack. 1802. Mahmoud Abdel Hadi al-Majdalawi, was killed in the same attack. 1803. Abdallah al-Majdalawi, was killed in the same attack. 1804. Khalil Mohammed Ramadan Abu Dabaa, 42, was killed in Rafah. 1805. Mohammed Sabri Atallah, 21, was found in al-Shifa Hospital. 1806. Issa Jonayed succumbed to his wounds in al-Shifa Hospital. 1807. Abdulhay Salamah al-Qrinawi, 45, succumbed to his wounds in al-Shifa Hospital. 1808. Hamadah Khalil al-Qaq was found in Kamal Idwan Hospital. 1809. Ahmad Khaled al-Qaq was found in Kamal Idwan Hospital. 1810. Suleiman Mohammed Maarouf was found in Kamal Idwan Hospital. 1811. Zaher al-Anqah was found in Kamal Idwan Hospital. 1812. Abdulnaser al-Ajouri was found in Kamal Idwan Hospital. 1813. Ezzedine Ghazi Taamieh was found in Kamal Idwan Hospital. 1814. Danielle Mansour was found in Kamal Idwan Hospital. 1815. Diaaeldine Mohammed al-Madhoun, 23, was killed in al-Sheikh Radwan. 1816. Ahmad Banat, 22, was killed in the same attack. 1817. Ashraf Mishaal, 25, was killed in Rafah. 1818. Fadi Madi, 23, was killed in the same attack. 1819. Aseel Mohammed al-Bakri, 8, was killed in Gaza. 1820. Fadi Abdulkarim Madi, 24, was killed in Rafah. 1821. Unknown was found Kuwait Hospital. 1822. Unknown was found in Kuwait Hospital. 1823. Unknown was found in Kuwait Hospital. 1824. Saher Talal Abu Mohsen, 23, was killed in Rafah. 1825. Aseel Saleh Abu Mohsen, 18, was killed in the same attack. 1826. Ibrisam Hamad al-Mahmoum, 18, was killed in the same attack. 1827. Hiba Mostafa al-Mahmoum, 7, was killed in the same attack. 1828. Obada Mostafa al-Mahmoum, 3, was killed in the same attack. 1829. Abdullah Moussi Hussein Mubarak, 50, was killed in north Gaza. 1830. Mohammed Zaki al-Lahham, 25, was found in Naser Hospital. 1831. Ahmad Abdulhalim Mohammed al-Astal, 26, was found in Naser Hospital. 1832. Unknown was found in Naser Hospital. 1833. Mohammed Saleh Shamali, 60, was killed in al-Shujayeh. 1834. Mohammed Fawzi Bahar, 22, was killed in al-Shujayeh. 1835. Mohammed Hosni Sokar, 20, was killed in al-Shujayeh. 1836. Ibrahim al-Mishhrawi, 30, was found in al-Shifa Hospital. 1837. Ibtisam al-Bakri, 38. was found in al-Shifa Hospital. 1861. Mohammed Amhad Owaidah, 12, was killed in Rafah. 1862. Amal Amjad Owaidah, 5, was killed in Rafah. 1863. Karam Mahrous Thahir, 24, was killed in Rafah. 1866. Fayez Ismail Abu Hamad, 34, succumbed to his wounds. 1867. Salah Ahmad al-Ghouti, 22, succumbed to his wounds. 1868. 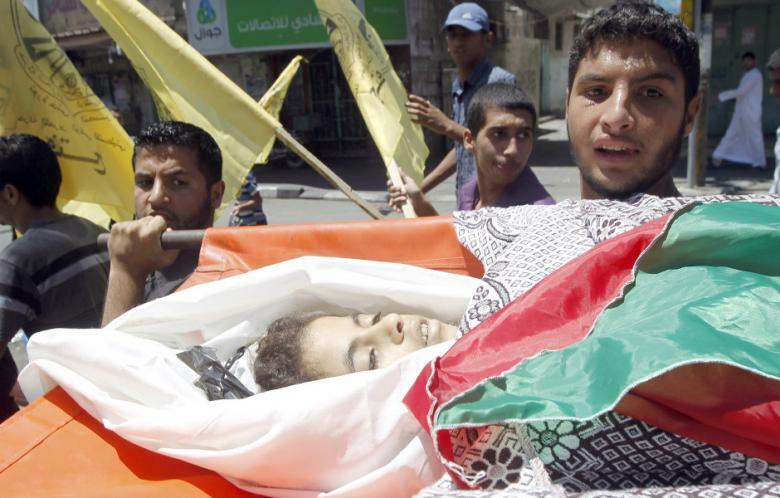 Nidal Raed Alawiah, 12, succumbed to his wounds. 1887. Ibrahim al-Dawawesah, 10, was killed in Israeli shelling of a mosque in north Gaza. 1940. Maydaa Mohammed Aslan, one month, succumbed to her wounds.